- It is 100% Pharmaceutical Grade for better, faster results. - It offers 16 of the most powerful and scientifically proven performance ingredients in the full clinical doses. - It provides energy at the cellular level as opposed to over-dose stimulant products, which only jack up your nervous system. - It contains the patented Carnosyn® (Instantized Beta Alanine) whichactivates enzymes responsible for generating muscle contractions & increases intra-muscular Carnosine, which is used by your type II muscle fibers for explosive movements like weight training and sprinting. - Magnum OPUS® raises your cellular pH levels; having an acidic pH not only causes lower muscle mass, but can also lower plasma levels of IGF-1. Having an acidic pH is not conducive to building muscle. 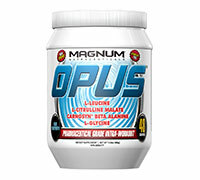 - A key ingredient in Magnum OPUS® is a neurotransmitter in the central nervous system and of major importance to the creation of protein, peptides and creatine.